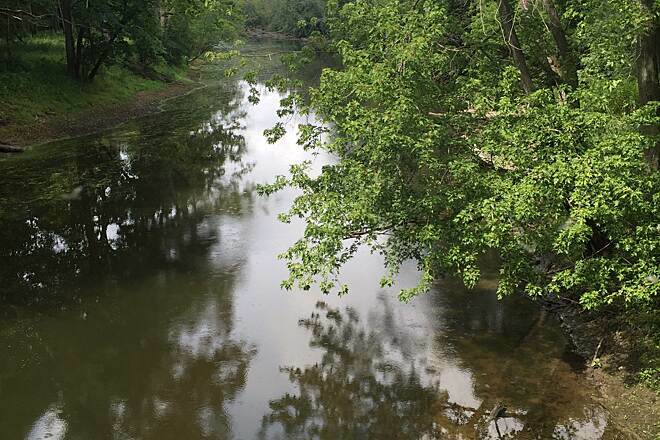 The Des Plaines River Trail runs alongside the Des Plaines River for just over 56 miles, protecting watershed habitat and forestland through much of Lake and Cook Counties. 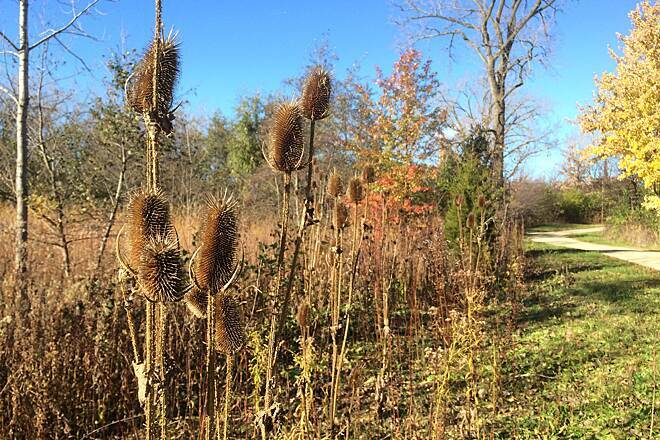 The trail is a natural oasis within a short drive of Chicago and its northern suburbs. Having such a long, lush trail just outside of such a densely populated urban area is truly a wonderful asset to the surrounding community. 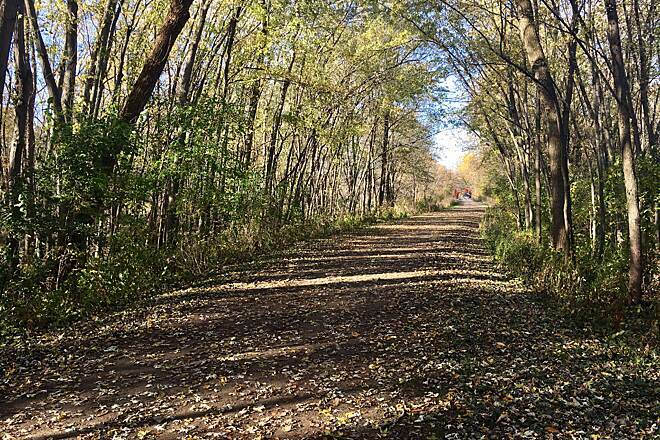 Traveling from the north end to the south end, you will experience a variety of trail surfaces, from pavement to crushed stone to single-track forest trail. Be prepared for this terrain to change quickly and often for an exciting adventure at every turn. More novice riders and hikers might wish to start at the northern end and travel south the first 20 miles. 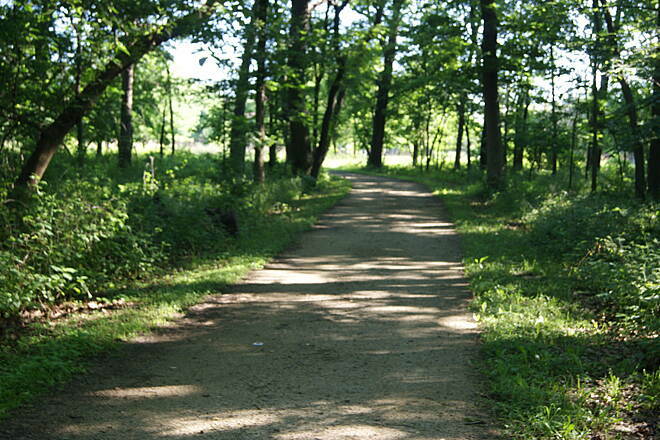 Along this segment, users will find that the trail is well maintained and frequented by nearby residents. 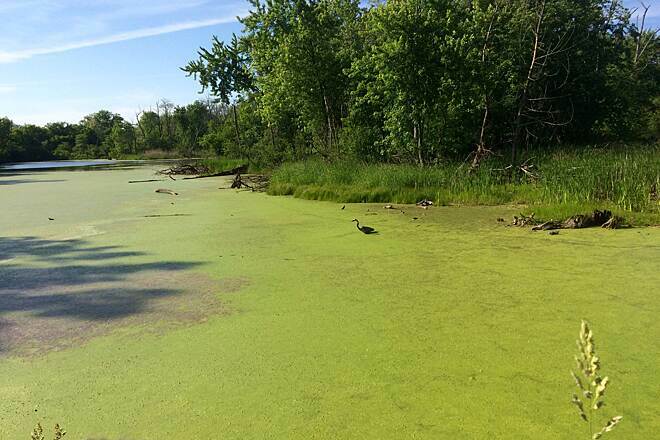 Keep an eye out for deer, birds, snakes, and turtles, all native to the area and abundant along the path. Moving farther south, the corridor becomes narrow and filled with roots in certain segments. If the ground is wet, be careful when making turns. 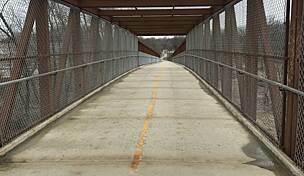 Also be cautious at the multiple instances where the trail crosses over several highly trafficked roads. Most of these intersections are well marked and have signals for cars to stop. Additionally, several crossings are by tunnel, which makes it much easier to continue along the trail at these intersections. Just north of Golf Road in Des Plaines, the trail runs into an active railroad line and continues just on the other side of the tracks. Caution should be used here when crossing the tracks. 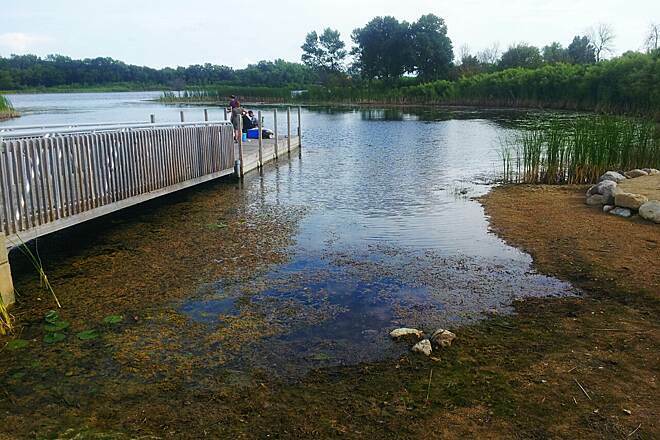 Restrooms, picnic areas, and water fountains are frequent throughout this system of connected forest preserves. Several parking lots are also located along the trail’s entire length, making it easy to access the route at a variety of points. 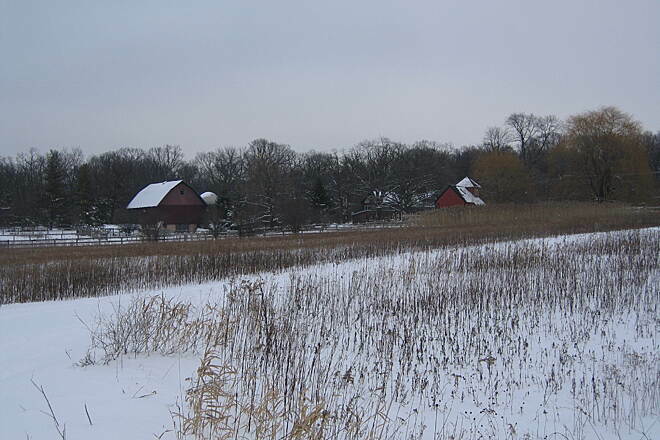 In Lake County, snowmobiles are permitted along the trail between Wadsworth Road (and in the wetlands research project area) and the northern terminus at Russell Road. 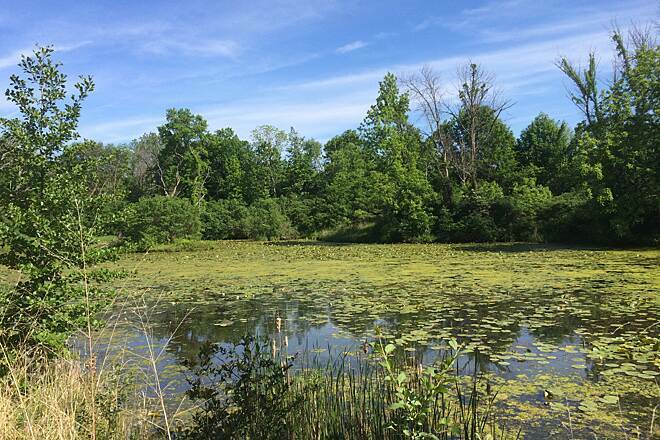 To reach the Van Patten Woods Forest Preserve at the north end of the trail: From I-94, take Exit 2 for IL 173/Rosecrans Road. 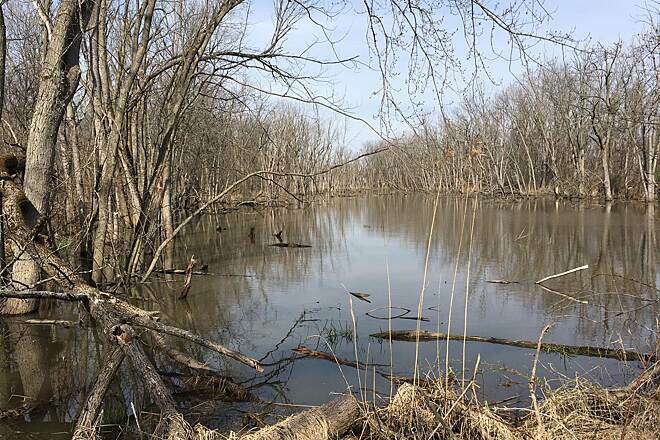 Head east on IL 173 E/Rosecrans Road and follow it 1 mile before taking a left into the Van Patten Woods Forest Preserve. 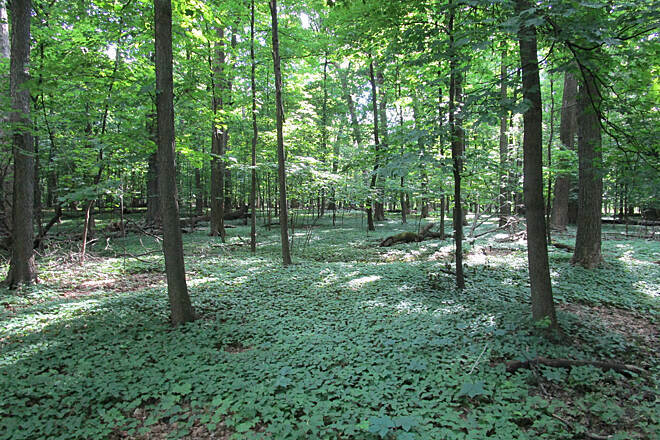 To reach the Jerome Huppert Woods Forest Preserve at the trail’s southern end: From I-294, take Exit 39 for Balmoral Ave. Head east on Balmoral Ave. and follow it 0.3 mile, and then turn right onto Des Plaines River Road/N. River Road. After 1.7 miles, turn left onto W. Irving Park Road/IL 19 and travel 1.1 miles before turning right onto N. Cumberland Ave./IL 171. Cumberland turns into Thatcher Ave., which then turns into N. First Ave. Two miles from W. Irving Park Road, turn left onto W. Fullerton Ave. and then turn right at the first cross street onto Thatcher Ave. 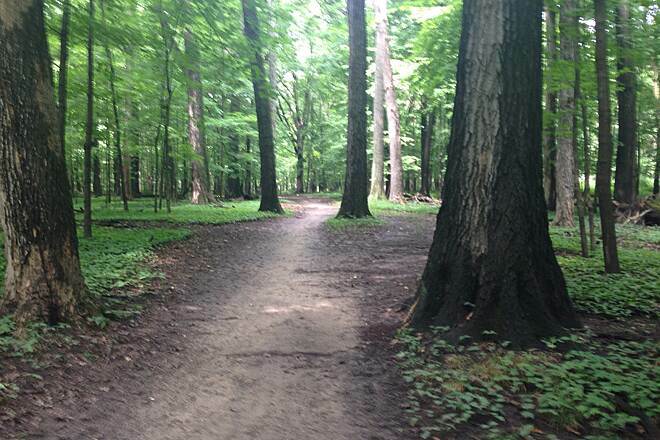 In 1 mile, you will reach Jerome Huppert Woods Forest Preserve; take a right to enter the park. Had a great time walking this section of trail saw 2 deer at Touhy and by the 294 underpass walked up into Des Plaines by Bender Road. Great trail full of changing landscapes, the only pity is that many times it's impossible to ride it because it's flooded. Apart from that, a well worth trail. Great walking trail north of touhy my only complaint is that it was flooded at the I 294 underpass. First ride of 2018, 42 miles down and only 1,958 to hit my annual target! The afternoon started out warm and sunny, a rare occurrence this Spring as the start of April hasn't been this cold in Chicago in 137 years with multiple snow storms! About 90 minutes into my ride the wind shifted and it was like someone turned on an air conditioner - in five minutes the temp went from high 60's to 50 degrees which is where I usually draw the line on riding 'cause it gets too cold for me. 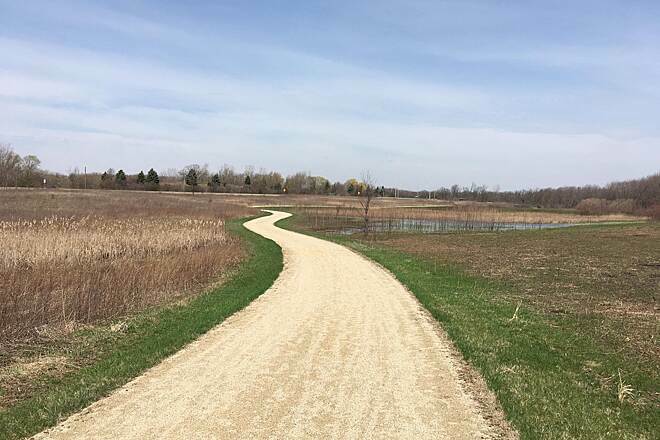 Overall trail conditions are pretty decent with no flooding from Deerfield Road up to Independence Grove and while the trail surface is somewhat rutted from the long winter it is in reasonably good shape. One word of caution, bring plenty of water as none of the wells along the trail are open for the season and are wrapped in plastic film. Not much in the way of color on the trail yet, it has been too cold for any spring flowers. I've now ridden the northern 20 or so miles twice, starting at Russell Road both times. The first couple miles are pretty rough due to the horses. That's not a knock on people riding horses on the trail, just the reality of hoofs digging into the crushed limestone surface. It seems to smooth out quite nicely after that and is very pleasant. Not many road crossings, which is great. Yesterday's ride was much cooler than my previous, but there are plenty of places to stop in the shade if needed. I'm not a fan of the crushed limestone surface simply because it leaves my bike caked in dust, but this is a nice trail for a day's use. -Some areas are pretty desolate. The solitude can be nice, but I can imagine it attracts criminals. 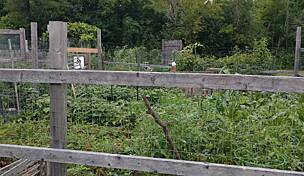 -The gravel/packed dirt is OK for the most part. Around Lincolnshire you start seeing more asphalt. To sum up, start north at Milwaukee. There's a big lot but you have to cross unprotected and bike beyond a hotel before the trail picks up again. After this there is only one other crossing at Dundee. Some people start across Dundee so they don't have to cross at all. I see a lot of five star reviews and I am guessing those come from people at the north end of this long trail. South of where it crosses Milwaukee Avenue, there are some pretty poor areas. It floods out, there are unsafe road crossings. In one place it comes down to a worn path barely a tire's width. South of Touhy Avenue the surface is uneven with some rocks and old broken asphalt. I ride this trail often because it is the one closest to me, but for the stretch I know, I cannot give this a high rating. 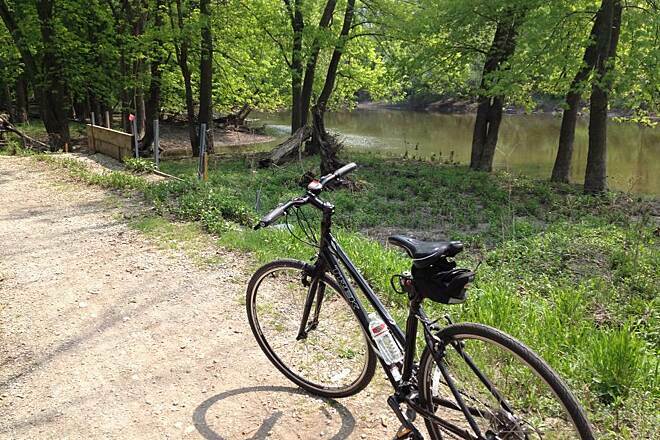 The North Branch Trail is much better, a few miles east. I love this trail. Lots of shades, beautiful scenery, lots of animals like birds squirrels bunny's deer... Bears.... ;-) (just kidding about the bears). So.. yeah its an awesome trail. I will keep coming back here. I would like to say the Lake County section is handicap accessible. jennpwilliams remarks about trail being ungroomed and not good can be true after heaving rains. 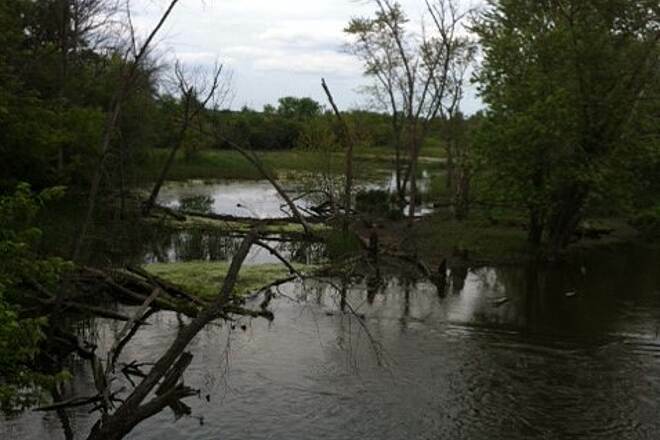 This is a river trail and flooding can take out sections. Once dried up I feel the forest preserve district does a great job of re-grooming the trail. Overall this trail is kept well and I truly enjoy my rides on this trail. What a mess, needs some gravel, no signs pointing to where to go. Really a mud / dirt path with some gravel in places. Not good even for cyclocross bikes. I can't imagine why they say this is wheelchair accessible either. There are huge tire tracks in the mud/dirt making it difficult to ride. Too bad because it's nice running along the river and has lots of shade. Won't do this again. I ran both county sections (Lake and Cook) down and back in the Fall of 2016. At 112 miles round trip, the trail is easily do-able over the course of the several week period. Running the while trail gave me a very enlightened perspective on the relative degree of trail maintenance and habitat quality between the Lake and Cook sides.The trail surface in Lake is far superior for most of its length, with fewer trail breaks. Healthy oak forests covered more of the Lake side, although I'd say that the area straddling Lake/Cook border region (from Cahokia Flats north of the Lake/Cook border down to Palatine Rd south of the border) has the largest numbers of massive mature oaks of any sections of the trail. This may be my favorite portion of the trail, and it felt like running through a primordial forest. I wasn't all that crazy about the Prairie sections north of Wadsworth Rd because it didn't provide much cover and, given the openness of the area the trail surface tended to be drier and harder, which was less forgiving on my joints. All the way down to the south quarter of the trail, I could not believe how rutted and uneven the trail surface could get. The underpass under Belmont was a total mud slick and a lot more ankle-turning holes covered the trail south of that section. But some of the habitat further south along the last 10 miles was just as beautiful as a lot of the sections closer to Lake. All in all, the beauty and excitement of DPRT far outweighed the low points and frustration along some sections, so I plan to run the entire 112 mile loop every Fall from now on. DPRT: Devon Ave. to Lake Ave. I rode this portion of the trail with some trepidation after having read other reviews and my own experience with the trail immediately south of this section (North Ave. to Devon). I was pleasantly surprised however to find that it was well maintained and (mostly) easy to follow. The section through downtown Des Plaines is quite nice, and would be a ideal place to stop for lunch. The underpass at Touhy Ave. - as others have noted - has deteriorated, and I would advise walking your bike through this area. It's still much better than trying to cross Touhy Ave. at street level, however. The only difficulty I encountered was the railroad crossing in the area called Kloempken Prairie on the route map (north of Golf Rd., south of Central Rd.). As you approach this area several signs indicate "Trail Ends" and "Active Railway." Indeed the path does appear to just dead end at a raised railroad bed with signs stating "Private Property" and "No Trespassing." It's not at all clear what you're supposed to do. When I arrived at this point there were (luckily) no trains in sight, and I simply carried my bike directly across the tracks and found that the trail continued on-wards. Not sure what I would have done if there had been a train parked there.... turn back, I guess. 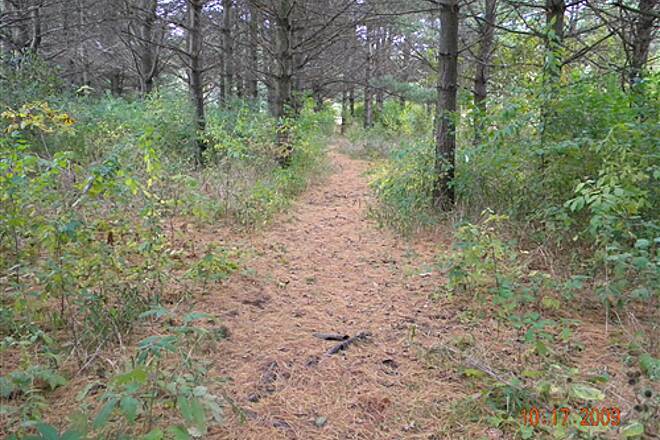 I left the trail at the Lake Avenue Woods-East area, finding a small path that led to Carol Ln. and then out to Milwaukee Ave. All-in-all it's a pretty nice section of the DPRT, and I'd encourage anyone to try it. 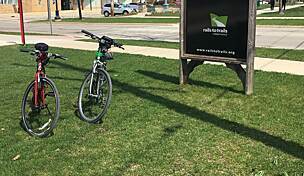 Rode the trail from Dam 4 in Park Ridge north today to just north of Golf Road. Generally a nice trail. Agree some of the trail is not well marked going north and you need to ride in the bike lane of the street for a short section. Noted some dangerous spots though. We haven't ridden north in a while (agree south is awful) but recall carrying our bikes over railroad tracks north of Golf Road in Des Plaines the past. A sign says the trails ends - active railroad crossing. (That is not indicated on the traillink map.) Indeed a train was crossing when we got there and we turned around.I recall the trail picked up on the other side of the tracks. Is there some other way to go to avoid the train crossing? 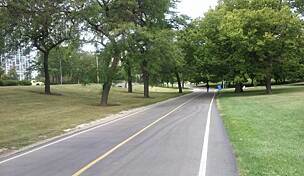 Also, crossing over Touhy Ave., which is not at an intersection, is dangerous. From the south side of the trail, it's hard to see the cars traveling east. 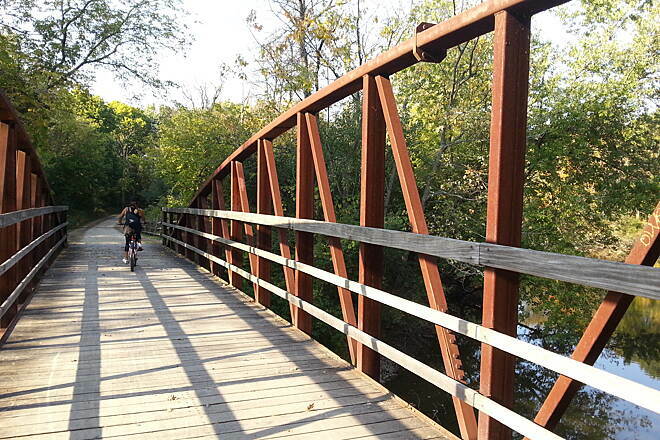 The other option is the trail under the bridge at Touhy. This short trail is in very poor condition. One concrete section is uneven and has wide cracks. You might want to walk your bike. At least you don't have to cross Touhy. I have now ridden the entire trail on a hybrid bike. 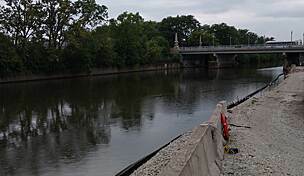 I live in Libertyville and ride the DPRT 3-4 times per week from about Rte 22 all of the way up to the Wisconsin Line. I've put on over 2500 miles just in Central Lake County on the DPRT and enjoyed every minute of it. Today, I rode all of the way to the south end which terminates at North Avenue in Maywood. The trail is great in Lake County, but pretty much as soon as I got into Cook County, it all went to hell. 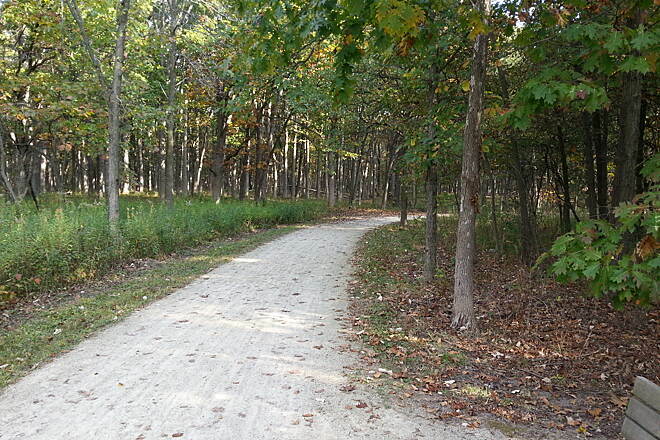 The only exception was an enjoyable area in Des Plaines where the trail is concrete, well marked and smooth. 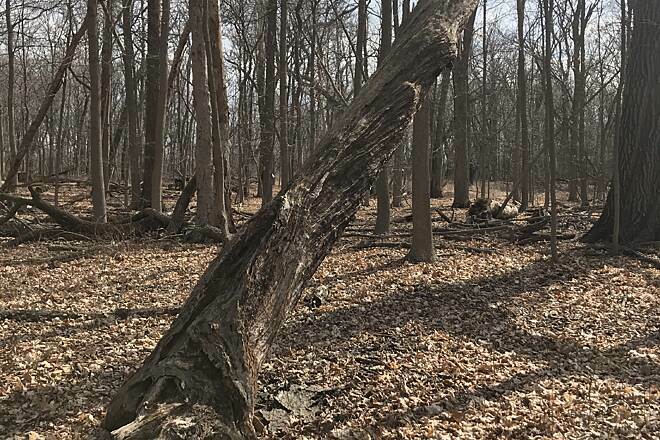 The Wheeling area is terrible to ride on with large rocks, tree roots, and ruts. I thought it might only be a short section, so I kept going. 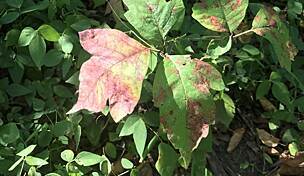 It is terribly marked, as noted by others, so be prepared to have to look for the trail. Even when you are on it in some areas, you'll think you're on a goat path. The area south of Touhy to the expressway was OK, but then the bridge was out at Cumberland. I'm sure it will be beautiful when done, but the re-route to the west and under the tollway was like off roading. There was one area that I had to walk the bike about 500 yards because of the ruts, mud and overall roughness. Then it got worse as I got south. What a waste of time. I feel like my 35-ish mile ride was like a 70 miler. Don't waste your time going south of Lake Cook Road. My wife and I have ridden our hybrid bikes from Lake Cook road to Russell Rd. and absolutely love this trail. Well maintained. This weekend we rode from Russell Road to Wadsworth Rd. and back about 15 miles and loved the views of the wet lands the passes through the mature woods and see three sets of horses with riders out for a ride. Nice variety of scenery. We went out Sunday afternoon and saw only a few other riders. Perfect. Lovely trail. It's pretty long and so far I've only run 20 miles of this trail but I love the hills I come across, beautiful views and on Saturday/Sunday mornings you run into alot of runners on the trail. Found a restroom along the way. It also runs into Independence Cove which have bathrooms and water fountains (beautiful place). The only thing is that some of path is under overpasses and sometimes the water is too high to get thru so you just have to turn around. Great trail. I ran 15 miles on this trail this morning and found it to be overall quite good. It is muddy towards the south end, but still passable -- this is after quite a lot of rain in the last few weeks, but only a bit over the past few days. 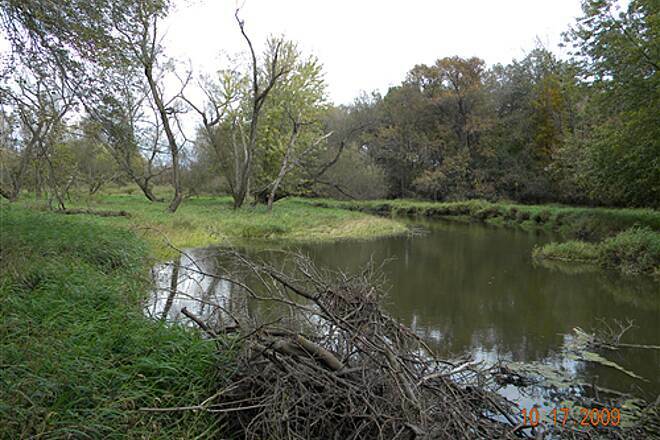 The northern part is less wooded, with some areas along the road and some paved path along the river. This part is not as well marked, and one point (at Campground Road Woods) it was not clear that I should cross the road and continue on the road, because it was not marked. I figured it out eventually, and will know for next time. I was there starting at 7 am on a Sunday, and it was moderately busy -- perfect for me, a woman running along, in that I never felt unsafe because there were plenty of people around, but I also did not feel as if it was too crowded. The biggest downside is that the road sounds are quite loud over a significant part of the trail. Thankfully there are several underpasses in addition to a few road crossings, and I did not have to stop often. Overall I would give it 4/5 stars and definitely plan to come here again because it is easily accessible to me. We started at the south end of the trail and managed to go 11 miles in 2 hours because we spent so much time trying to figure out where the trail was, wading through mud, and jumping over trees across the path. This trail wouldn't have been so awful if you could have just see where the d@m thing was. It's real hard to tell mud from more mud in every direction. This is the best trail! This trail is amazing! It has a some challenges along the course like quick turns,bumps, and sometimes some mud. The scernery is like no other trail I've experienced in Illinois. 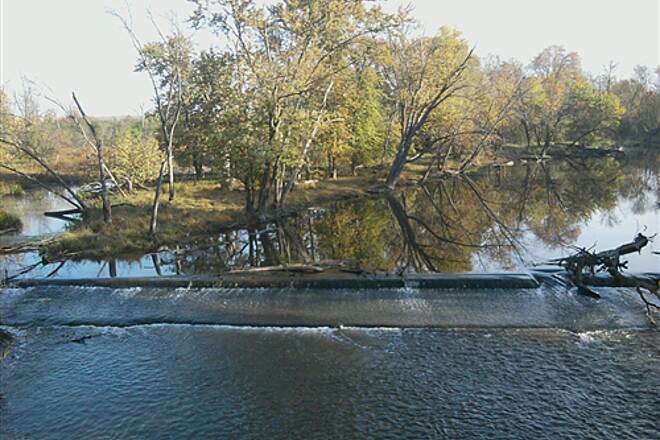 Nothing like biking along this beautiful river. If I had one complaint it would be the need for an overpass over Dundee. 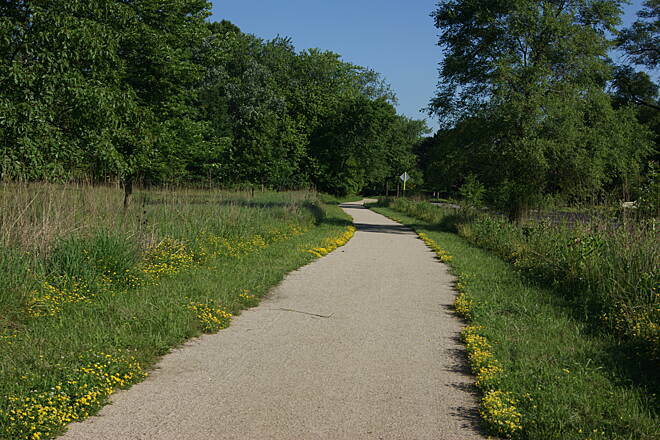 The trail itself is well maintained especially in the Lake County segment. This trail is perfect for a mountain bike! Be careful if you ride within a week of a rainstorm. I took my daughters for an afternoon ride about a week after we got a big rain. We got about a mile or two North of the Fullerton entrance and wiped out and got stuck in the mud. It was great for mud pies and luckily none of us got hurt, but it could be treacherous. It still was very beautiful, but proceed with caution. A dream trail right under our noses! I've lived in the Chicago area my entire life. 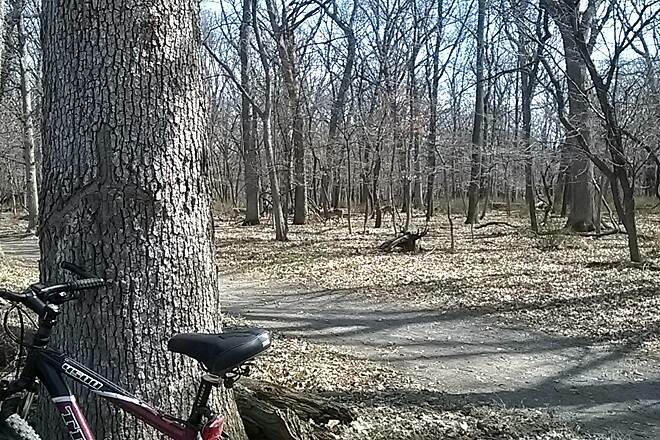 All this time I've driven around the forest preserves...today I did twelve miles IN the preserves...WHAT A TREAT! This is a must-do for families and riders alike. Lake County well groomed and engineered. Cook County rougher and more challenging! I've been on multiple sections of DPR from Glenview north. As others have noted, there are sections that, if it has been raining, can be virtually impassable. On the other hand, the sections from Lincolnshire are uniformly dry; run through really attractive ecosystems; and have underpasses so that riders can avoid the hyper-busy suburban highways. The only down sides are that there are places where the trail parallels one of the aforementioned high-traffic roads, and the winding nature of the route can lead to close calls with approaching users, especially if one or both of you is moving at a reasonably high speed. I wouldn't try my road bike on the DPR unless I had a repair kit, but the trail is, with the exception of some short areas of deeper sand, really smooth and an easy ride. 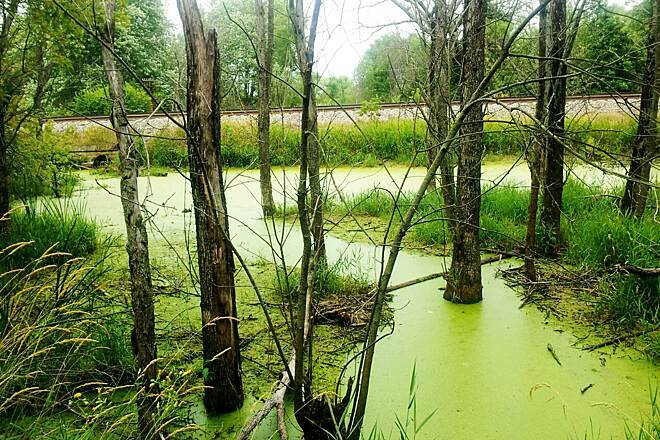 Cook county and more specifically the towns and villages where this trail runs through need to get their act in gear. 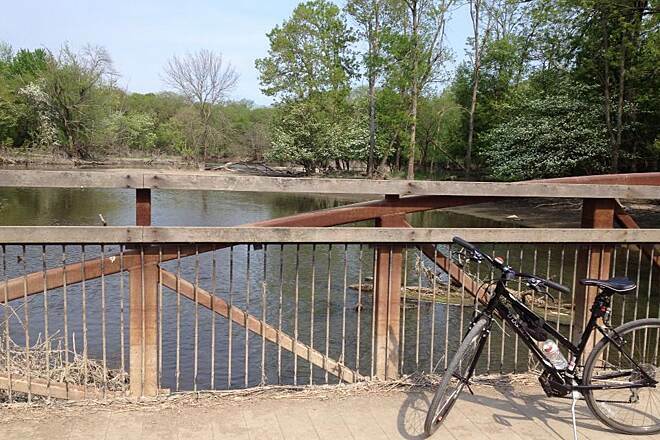 Riding this trail south of Lawrence avenue in Schiller Park is for thrill seekers and off-road fat tire bikers only. The trail north of here to Higgins is hard pack and loose gravel until Higgins Rd. 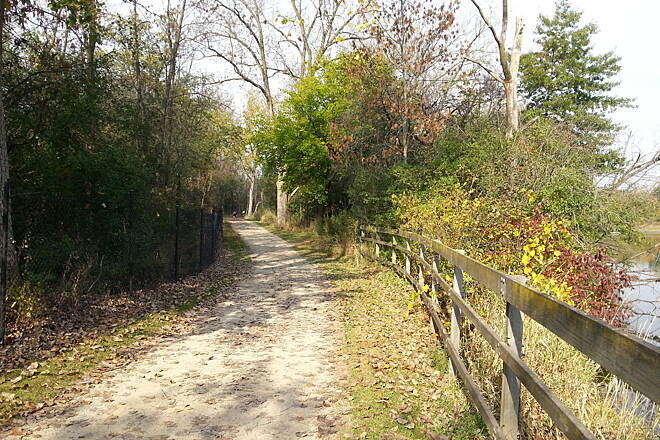 Then the trail heads through Park Ridge. Shame on you Park Ridge! There are portions of this trail that are ride-able only after long dry spells... there is so much mud here during wet seasons. 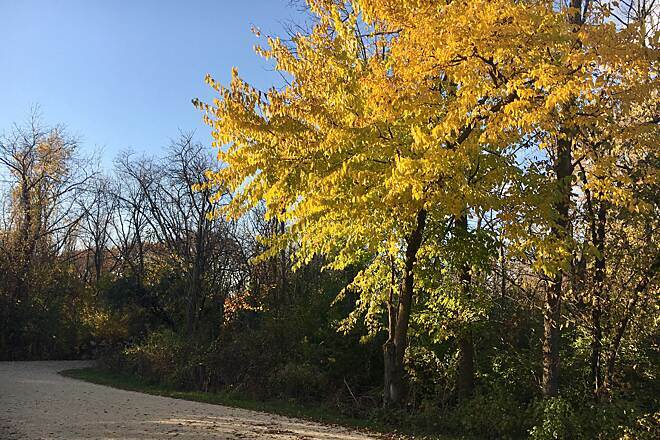 Park Ridge needs to take a cue from Des Plaines of all towns because north of Touhy begins a beautiful stretch of limestone and concrete trails all the way north to Milwaukee avenue. North of Milwaukee you have to exit Allison woods and cross Milwaukee and take Winkelman road for a quarter of a mile. Here is where the trail degenerates into a quagmire of gravel and poorly marked mud trail. It's actually disgraceful and I would not recommend a road bike here. The cities of Mt Prospect and Wheeling should be ashamed of themselves. 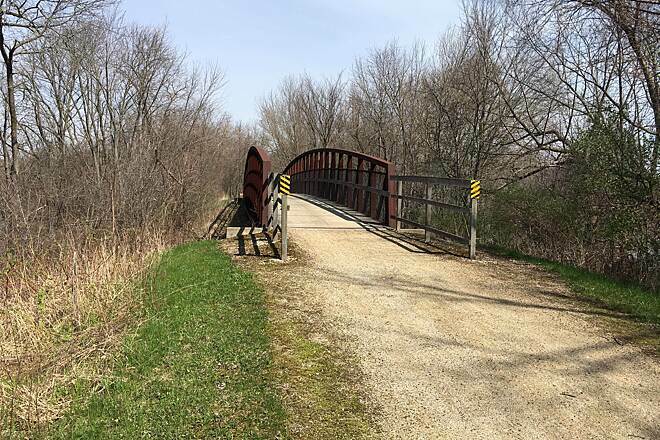 There is a nice bridge over Willow Road; a sign that maybe the county has plans for the trail south and north of this bridge, but much of it has been neglected for a long period of time. Remarkably there are rideable sections, but again, I would only recommend fat tires and spare tubes on this portion of the trail. Once you cross Lake Cook Road, the good stuff begins. Luckily, most of this trail is actually in Lake County; and they have done a great job making this one long, limestone crushed beauty almost all the way up to the Wisconsin border. You will see some beautiful terrain here and some welcome shady runs through thickets of trees which open up to beautiful wide open prairies. 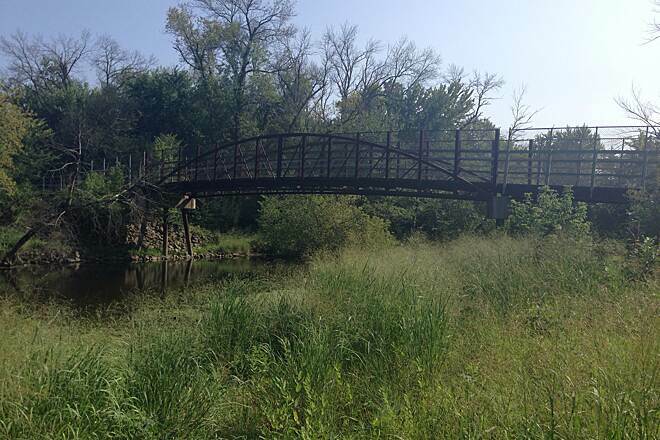 You will cross the river several times on beautiful bridges until you hit Independence Grove which is worth it as a destination all to of itself. 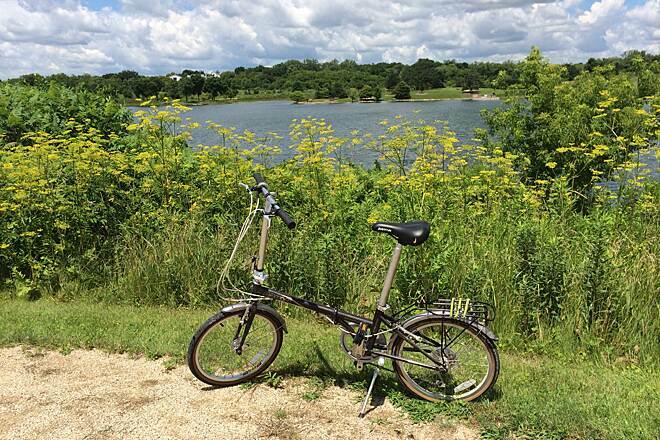 It has its own system of bike trails circling what was once an open quarry but is now lush lagoons and greenery. A very nice club house and beach are at the center and the club house serves some overpriced but decent food along with beer to replenish the body. The trail continues on north of Independence Grove in fine fashion. It's a little more challenging with more hilly terrain but the trail is in wonderful shape. It just peters out south of the Wisconsin border. All in all, a very nice ride save for the few blighted spots in Cook County. Hopefully the politicians can scrape up some cash to make this a truly great ride; especially the section between Winkelman and Lake Cook. Go to it pols!!! This is my favorite nearby ride as I live in SE Wisconsin. The trail is gravel, with some occassional minor elevation and plenty of twists and turns. I have logged about 2500 miles on this trail in 2 years and I never get bored of it...going North from Independence Grove there is a slight bit of elevation to push you. this trail has so much to offer! one of my favorite bike paths for sure! Route condtions vary between which city you are riding in. The Rosemont side is more well kept then the Schiller Park side. None the less there are a ton of deer! Pros: Very scenic, excellent signage, lots of wildlife, quiet. Cons: On a bike, I found it was muddy and hard to push through on road tires after a light rain in November. 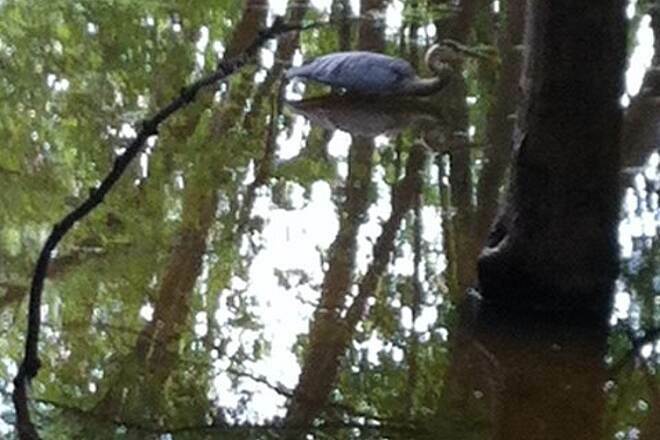 There is always some sort of wildlife on the northern part of this trail. Deer, Turtles, Frogs,very scenic nice trail to ride. Well marked with mile markers every 1/4 mile. There are a couple restrooms along the way not much water unless you venture off the path. Very nice to ride in the Fall colors. I usually bike from Russel road to St Mary's Rd or Route 60 and it is always a nice ride. 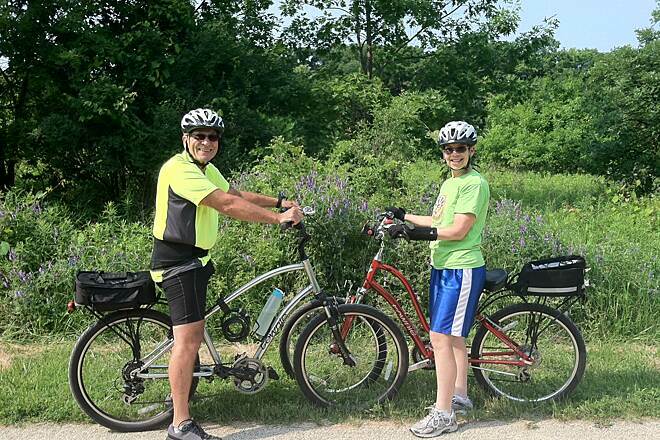 We rode our bikes from the north trailhead off of Russell Road all the way to Potawatomi Woods off of Dundee Road. It was wonderful!! The trail is in fantastic shape, the scenery was beautiful and we got lucky with how amazing the weather was. We stopped for lunch halfway down at Independence Grove and felt spoiled by the amazing selection their cafe offers. Nothing like a cold beer after riding. :) I highly recommend this trail! Nice trail!! Good for run and ride!! 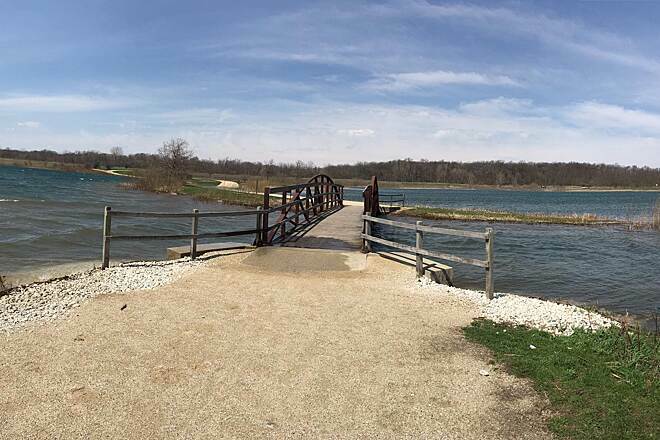 We drove up from NW Indiana to ride the Lake County portion of the trail. We parked at Adler Park, which was free parking. 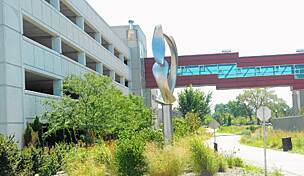 If you park at Independence Grove and are not from Lake County, you will have to pay a fee. This portion is very well marked, plenty of benches for resting and very scenic. The trail is definitely suited more for mountain bikes ~ not road bikes. This is probably the dustiest trail we have ridden on, with plenty of loose gravel. Again, thankful we had mountain bikes. We biked 31 miles and I, especially, was exhausted. Lots of hills. It felt like we were taking more breaks than usual. At the northern end of the trail, there is a lake with a picnic area ~ very beautiful and peaceful. All in all, we thought the DesPlaines Trail was worth the trip out. First time on this trail in July of 2014. Unbelievable signage - every quarter mile distance signs, many access points so very prevalent trail signs guide you and finally many "you are here" markers to get your bearings. 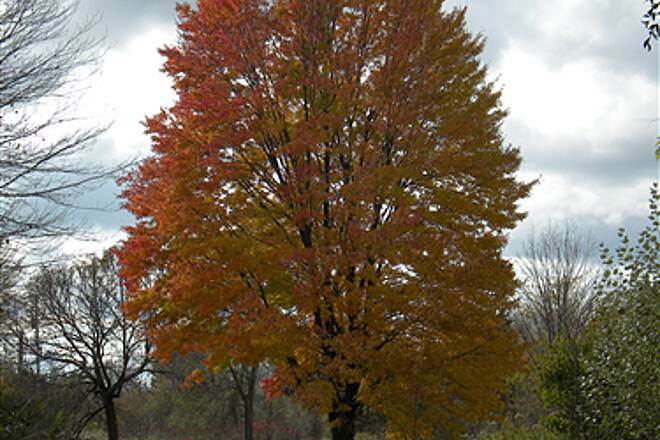 Multiple forest preserves, parks and restrooms along the trail. 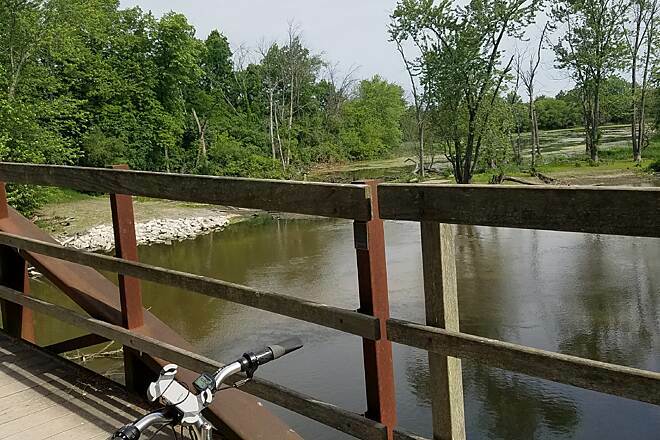 I am from Wi and we tend to make fun of our Illinois brethren - toll booths, traffic jams, flat landers, etc but to ride this trail is certaining worth a trip south of the state line! I just "discovered" this trail last week. (yes I knew there was a trail there but had never ventured onto it. This Trail is for walking, biking, running and horseback riding- as noted by the "droppings" along the trail. I was on my road bike. I only rode a short distance (Rte 176 to Rte 22 and didn't take any of the side loops. (My parents live off of 22 so it was truly to Grandmother's house!) 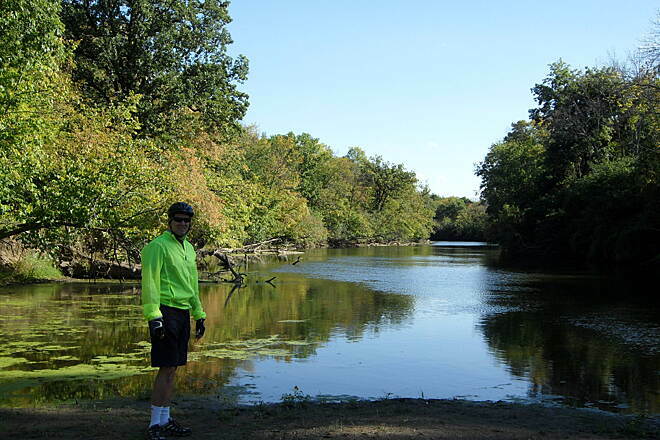 This trail winds its way through woods, lagoons, forest preserves, picnic areas and the like. The views are scenic and I wish I had brought my pocket camera. At times you feel as if you are in the wilderness- Then you look into the far distance and see houses or commercial buildings or hear the road traffic. Still it is a nice escape. While it had been pretty wet here lately the trail was in good shape. 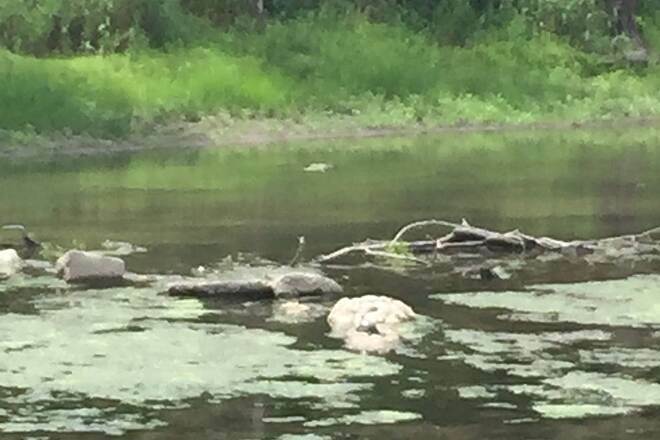 Note that since you are riding next to the river there may be flooding over the trail. The Rte 60 underpasss was closed but the water was only about 6-8" so I grabbed on to the railing and pulled my way across. The only criticism is that maybe given the closures along the route they should put a stair access at those points or tell users of an alternate route to get around the closures, as I'm pretty sure these occur at the same spots all the time. The trail really winds at this point so fast paced riding will lead to your ending up in the woods on some of the unviewable hard angle turns if you go to fast. As well the trial is very soft or sandy or thick gravely in many spots so it wasn't great for a road bike. (Would be well suited to a hybrid, mouontain or wider tire bike.) Still traversible with a road bike thoung not great-but if your looking for the view/scenery it is worth it. This is a great trail to ride. 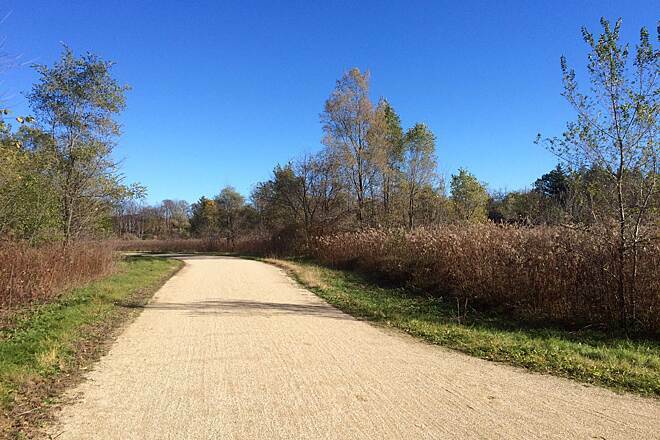 Cook county provides hidden unpaved trails(packed dirt) that weave through the city and suburbs. Great scenic river views. 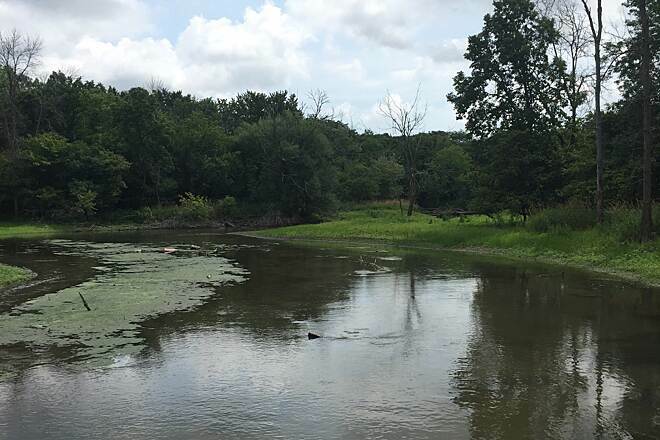 The lake county portion is crushed limestone and the scenery is breathtaking with lush vegetation, wildlife, streams and dams and great bridges. It is a very relaxing ride or you can go for speed, if that's your thing. 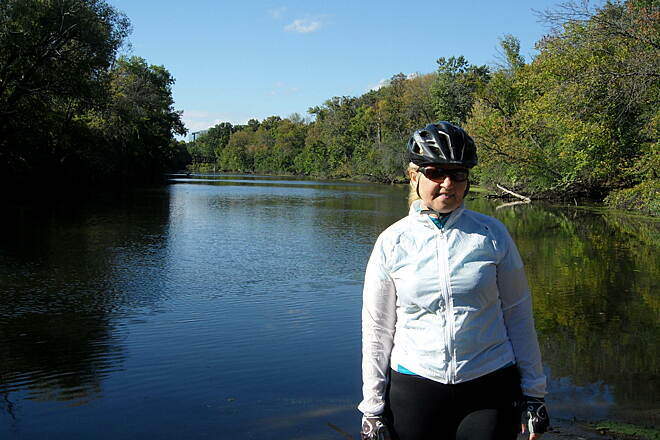 I do the whole trail from Elmwood Park all the way up to the Wisconsin border every year and make a 2 day trip of it. I found this trail near my house, and I admit that early in the season - or as long as there are steady rains - the southern portion is a tough ride for any but the hardiest mountain bikers. I ride a mountain bike with hybrid treads. Also, admittedly, the beginning portion of the trail near North avenue is not well-marked. 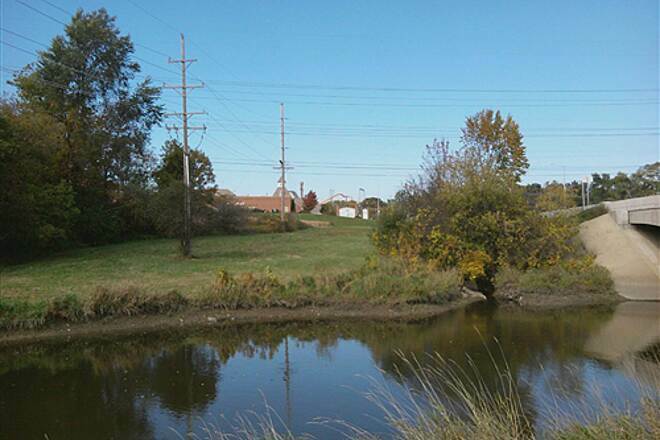 If coming in at the park across from Menards: Enter the woods on the large path where the road curves, turn left on the small path before the river, and in a hundred feet there will be a bridge across the river on your left. YOU'RE THERE! I like the ups and downs - although the major hill by Grand Ave. can be circumvented if you are crossing there. Just take the trail to the left before coming to Grand. Nevertheless, when this trail is dry, it is an incredible escape from the city. Sure, the occasional idiot on a gas-powered mini-bike comes along. It's the city. But there's adventure on those trails - though I've yet to cross paths with anyone sketchy. Lots of walkers when the season is high and dry. Don't deny yourself the fun. Unless you must have a paved trail because you are an entitled suburbanite or otherwise infirm. 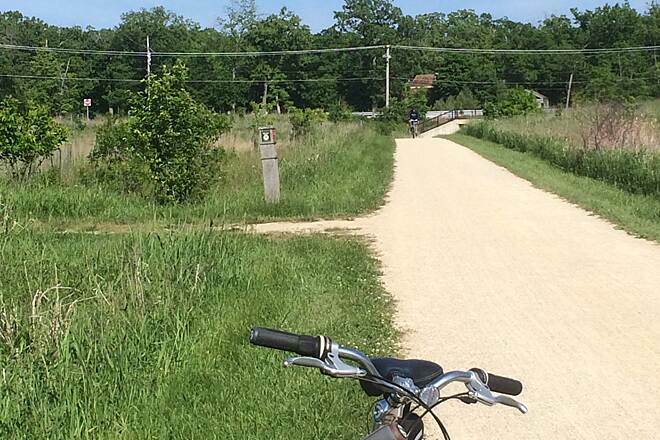 Did the trail today, my first in 10yrs., kind of tricky to find but I think worth a try: I started in River Grove and ended up loving a 4 and a half hour ride. Try it you just may like it. 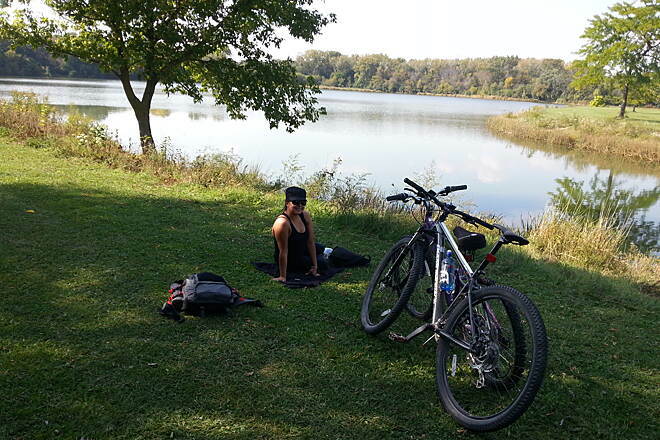 We had a beautiful Labor Day bike ride on the trail, from Campground Road in Des Plaines north to Potowatomi Park in Wheeling. The trail was in good shape (although not paved). A few bumps and sandy spots, but generally easy and level. If going with kids, be aware of a few busy street crossings along the way. Crossing Milwaukee Ave. near the Hilton can be especially tricky, and the trail connection is not well marked (you have to go about 1/4 mile north of Milwaukee Ave. to find the trail again on your left. 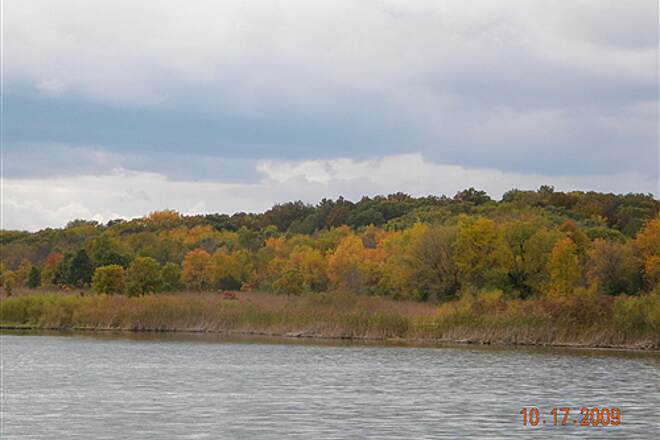 Lots of forested trail, winding near the river, and a few patches of prairie. 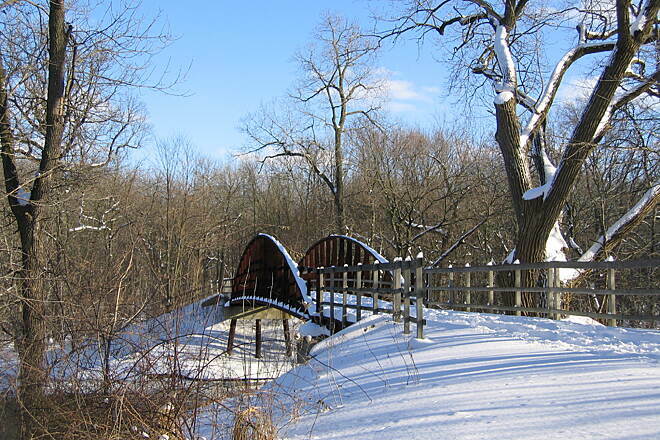 Several forest preserve parks along the way if you want to stop for a picnic or a rest. 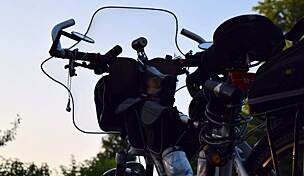 It's a great ride for recreational bikers; we're looking forward to returning. I wish the Horse manure was cleaned up by owners! I love riding this trail other than the landmines! Not too flat some hills and I always see deer along the path. This is a good ride even when it is hot and sunny out, a lot of it is through woods with shade. I ride from Russel Rd south to Rt22 and really enjoy it! Ride this trail often starting at east river and central.Curvy and hilly two hands on your grips.You have to pay attention to the path.Good workout and not crowded.Not a la dee da path.Great scenery and quiet.For trail and mountain bikes. I picked up the trail from the far south end off of North Ave. in Elmwood Park and rode it to Grand Ave. in River Grove where I gave up. This would be a good trail for a horse not a bike. It was pretty much a mud/river path, unrideable at certain points because the river had swamped the path. At one point it seemed some beavers made a dam across the path. Even if it was dry it is still a mud path here and not even limestone. I had an impossible time finding where the path even started (no markers) and when I asked a worker he just pointed and mumbled something. Turns out I was already on it! I couldn't tell though because it was so horrible. At Grand Ave. the trail takes a steep dive off of the road. How would an older person ever ride this trail? I'm 32 and I ride a cyclocross bike. A wasted ride when I could have done the Prairie Path or Salt Creek trail. It was a joke, it really gets 0 stars for the portion I rode. I wondered why I saw no one else riding it for the first 100 yards or so and now it is quite clear. A beautiful, meandering, trail composed mostly of crushed limestone. While the trail is deep into suburbia, there are sections of the trail that are so sheltered you would think you're miles from civilization. Ten minutes later, you're crossing under a major road or are able to see someone's back yard. It's really the best of all worlds. The farther north you go, the less populated the area becomes. The hilliest area, is just north of route 137 and south of route 120. In this part of Illinois a hill is anything that isn't flat as a pancake. For those of you that have real hills in your area, you'll laugh at my description of "hilly". 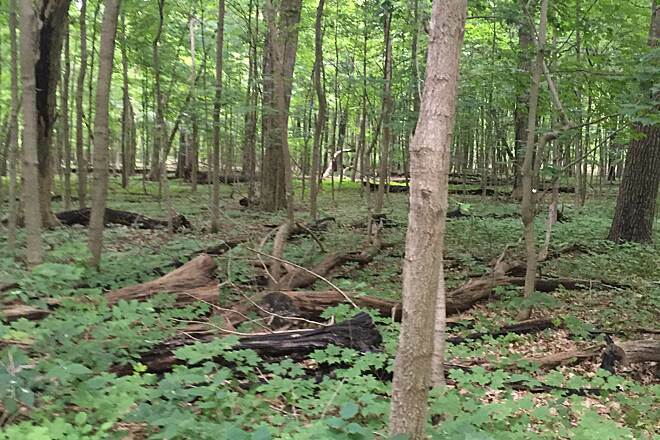 Check out the trail map and locate Independence Grove. It's just off Route 137. 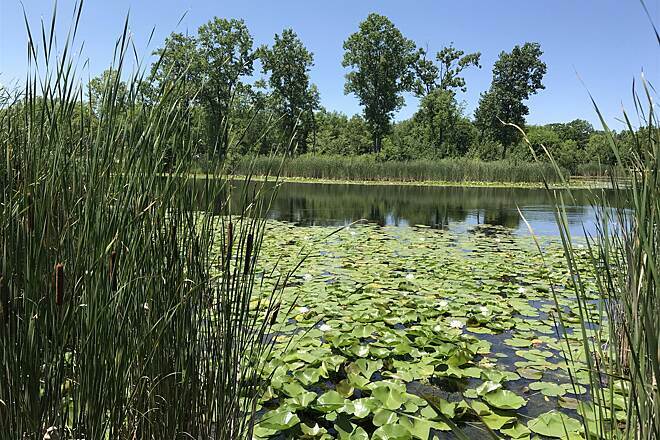 A former rock quarry has been transformed into rolling green hillsides, lakes and a 2 to 3 mile paved path that skirts the outside edge of Independence Grove. If you're riding your bike from the trail and happen to stop off at this beautiful gem, it's free. 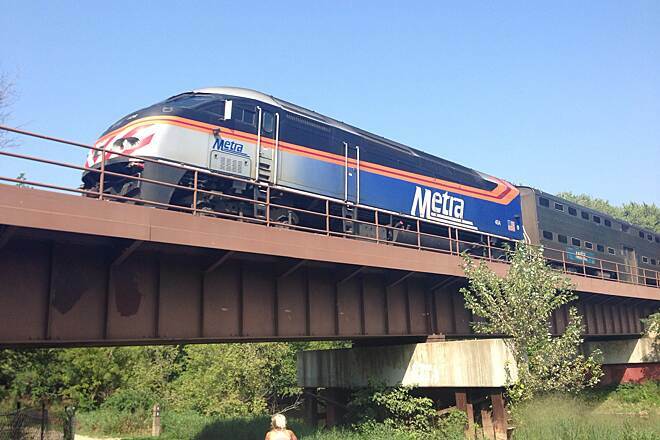 Free for Lake County Illinois residents; $5 per car for nonresidents Mon–Thu, $10 per car Fri, Sat, Sun and holidays. Lake County residents can purchase a vehicle window sticker to bypass stopping to show the required proof of county residency on each visit. Just point out your sticker to the gate attendant and they'll wave you through. 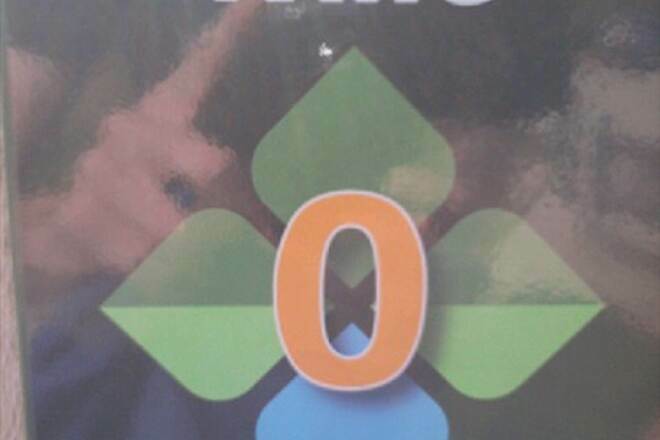 The sticker is good for the life of the vehicle's window and is non-transferrable. Fee is $5 and available for purchase at the Visitors Center. The northern most section of trail from Wadsworth Rd north to the Wisconsin state line is the rockiest. No other section south of Wadsworth road could be described as rocky. 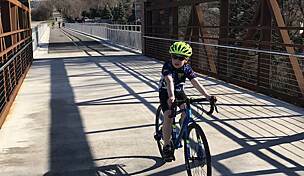 The crushed limestone surface is easy to ride for those with cross bikes, hybrid bikes, mountain bikes and anything with tires wider than 1 1/2 inches. Road bikes are also fine as long as the trail is well packed. Occasionally after a big storm, there will be gulleys 4-8" wide where the packed limestone has been sculpted by the rain. This results in some soft sand like sections that can be difficult to get through unless you're either strong and can power through the section (maybe 20 - 40 feet) or are willing to just get off your bike and walk it through the area for 20 seconds. By the way, I ride my road bike with 22 mm wide (less than an inch) tires all the time. I just learned to power through the soft stuff when I see it. I love Independence Grove. 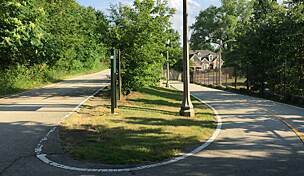 While you're on the trail, you'll merge right onto the paved ring path around the grove and stay on it for maybe a quarter of a mile before you have the option to get back on the trail. There are nice, clean picnic shelters and a bathroom right off the trail. If you're coming off the trail, look for the closest picnic shelter (it's fairly large with a fireplace if I remember correctly). Right across from the shelter is the bathroom. Nothing fancy, but there is a drinking fountain right outside the bathroom that you can use to fill up your water bottles if needed. If you happen to be on the trail and are looking for somewhere to eat (again nothing fancy, just fast food) find the intersection of the trail and Route 176. There is a Culver's just west of the intersection, right off the trail. It's literally a 3 min ride from the intersection to Culver's. South of Route 60 as you approach Route 22 (half day road) you'll find yourself suddenly thrust into some major cross roads in suburbia. Once you've hit Route 22 (half day road) you're not far from the Lincolnshire Marriott Resort. I have attempted to go past the Lincolnshire Marriott but there is an unfinished section south of the resort that it a little bit of a pain to get around, so I haven't done it. Great trail, check it out. One of the best urban/suburban trails I've ever ridden. The trail has a little bit of everything. 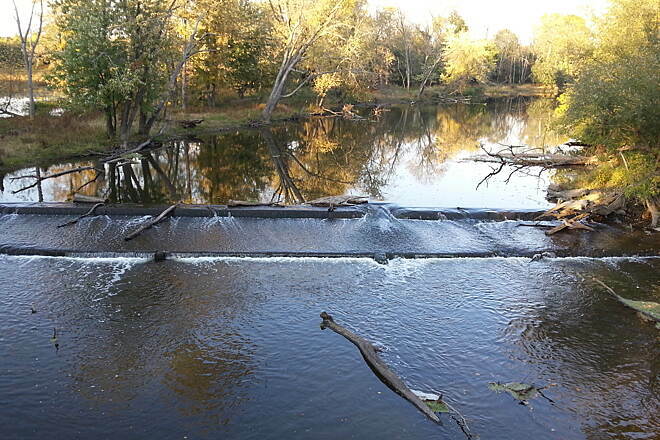 Some sections go through prairie, others through forests and still others travel next to the river. 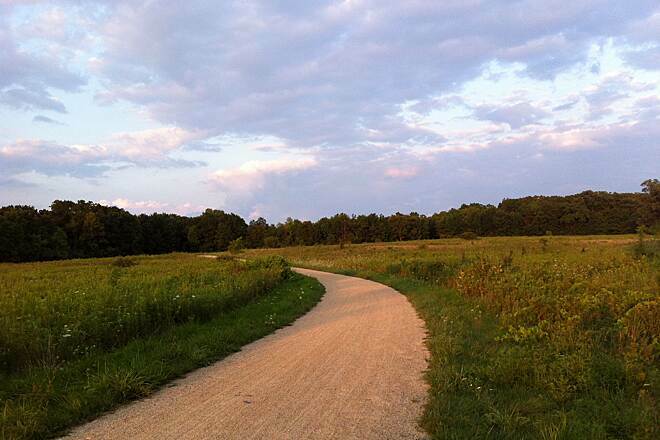 The trail is relatively flat, making it an excellent trail for biking, running, or horseback riding. 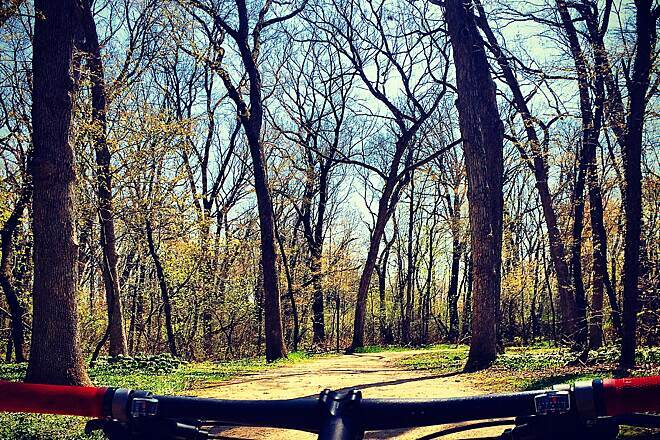 Des Plaines is cleary what the title says one of the best trails to ride on. I would recommend you start at the very beginning and the Van Patten Woods. It starts just a little bit past the Canoe launch area so just keeping going past it and you'll see the bike entrance. It's a very beautiful scenic ride and very photogenic trail and it's very relaxing and enjoyable. Plenty of resting and shady areas and lakes and ponds and plenty of wildlife to enjoy and it's all well taken care of through out the year and safe to ride on. I must address this and please do watch out for horse droppings that may still be festering on the trail that haven't been picked up yet as you don't want to ride through that yuck! Other than that the trail is one of the best ones to ride on for bikers of all levels. It's also good for jogging/running, and the occasionaly horse back. Please watch out for horses and approach them with caution so you don't spook them. Independence Grove is my favorite place to finally get to when riding through the trail as it's always full of life and energy. It's full of friendly people and activity and a great resting stop as it has a nice little cafe for any hunger or thirsty needs you may get. 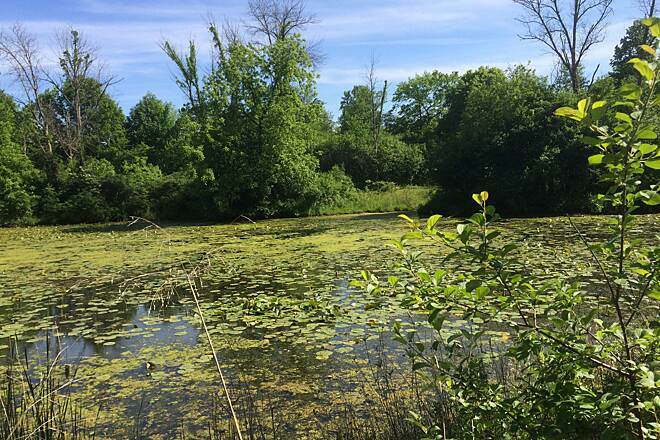 The trail goes around the little lake they have there and connects with other trails just like through out des plaines you can find connecting trails and I recommend exploring them all when you have the time it's quite the memorable journey. It's also really neat riding through the Rollin savanna area and you can see how far the trail goes up ahead and your out in the open. It's nice and enjoyable to ride through there and that's the one part your out in the open and the sun can really beat down on ya on a hot day when riding through that part so have plenty of sunscreen with you. 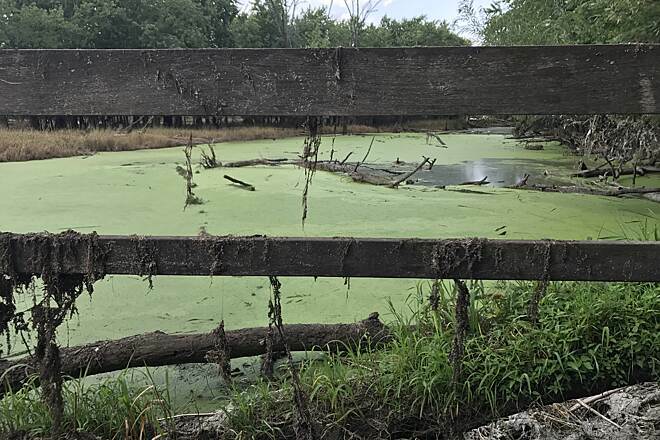 You don't have to worry about traffic as you either go over or under any major roadways, but make sure the trails are open as it can get flooded easily during heavy rainfall or days of rain which can cause parts of the trails to be closed until it goes down. 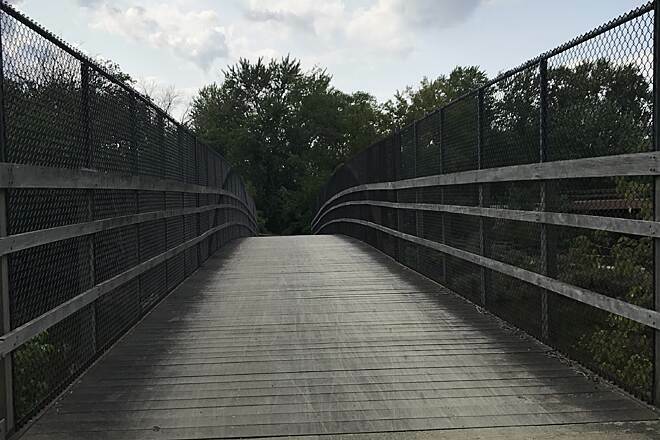 They have a website you can visit for any more info concerning the Des Plaines trail it's easy to find on the web. It's flat, crushed stone, asphalt, and well sort of hilly, but not really. It's a great place to ride and explore it's one of the nicest, relaxing, enjoyable, well taken care of trails to vist and ride through. The MacArthur Woods is also another great spot to ride through. 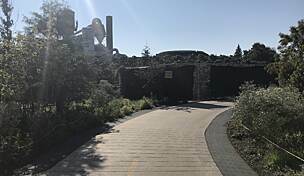 The Millenium Trail is a connecting trail and is worth checking out as well and run to ride. Make sure you bring a camera if your a photography biker so you have plenty of memories of the ride and of the family as the trail provides alot of diversity and great views and scenery and photo ops. Just so many sights to see and check out along the way on the trail. The whole trail is a great ride and worth the trip and experience as I ride through/ on it at least 5-10 times each summer. Also please stay in a single file line when riding so you don't cause any accidents with any oncoming bikers from the opposite direction and there are many bikers on it and some of them ride pretty fast and come out out of nowhere and it wouldn't be fun to get runover or collide with any of them so listen to the signs they have up and ride single fine. Don't ride side by side cause it's no fun to end a bike trip in the hospital so please be aware of everything going on and ride safe. The trail is perfect for everyone to enjoy. Happy riding everyone! I've ridden this trail twice in the last year and both times were very nice, most recently a week ago. The trail is crushed gravel and in good condition most of the way. The first time there were a couple of muddy spots but this last time (in mid-July) the riding conditions were good the whole way (except for one brief detour). 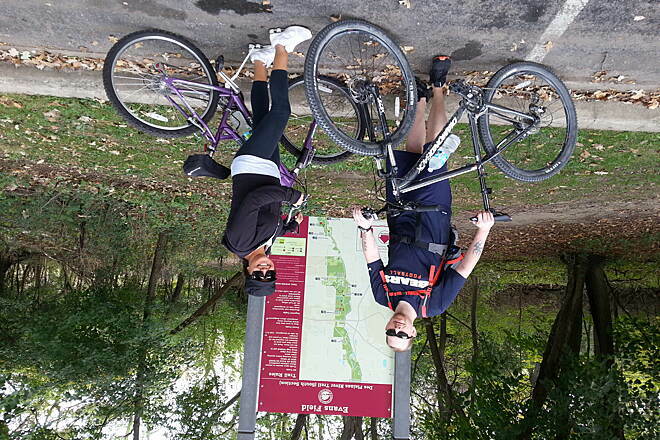 Both times we started at Half Day Forest Preserve and rode north, turning around about 5 miles short of the trail's northern end for a ride of about 50 miles. Macarthur Woods has a nice little lake and with water and toilets also available makes a nice spot for a break. There's some more or less gentle ups and downs and lots of curves and although most of the trail is in the woods there are a couple of nice prairie sections. There are relatively few road crossings. 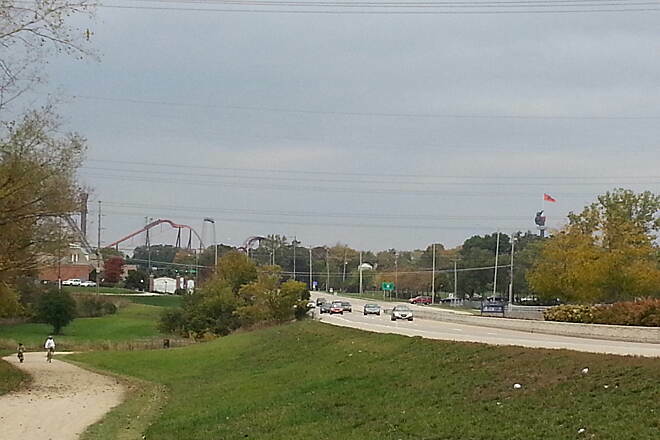 I like coming out of the woods near the Washington road underpass and seeing the roller coasters at Six Flags. "Started at 1/2 Day road went about 15 miles north and back . I thought it was scenic and enjoyed its diversity. 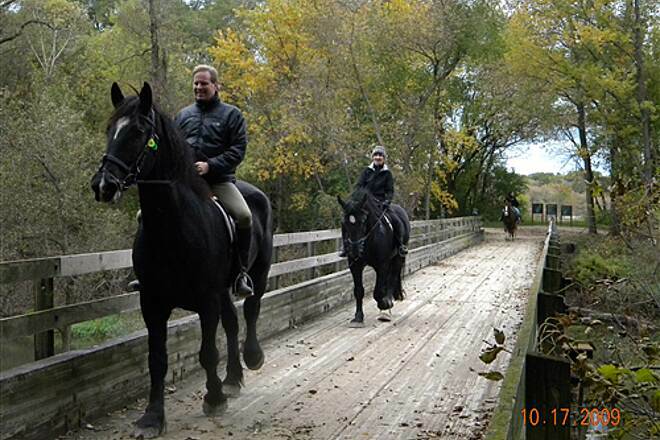 It was well maintained and was well traveled by bikers,walkers,joggers, and horses. " 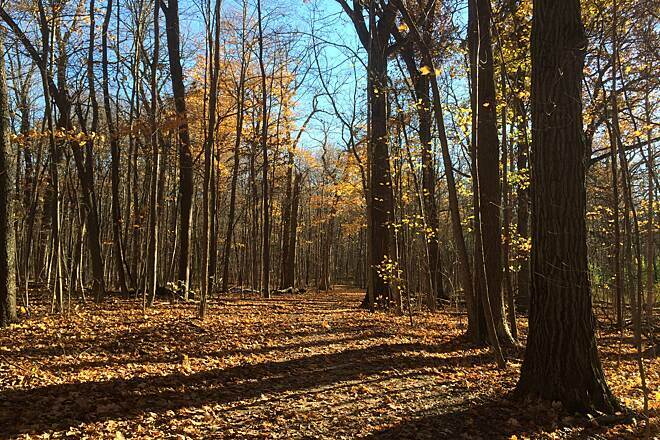 "I have been using this trail to run on for about two years, and I think it is a great trail. 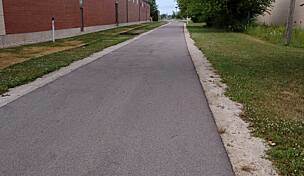 The surface is usually finely-crushed gravel that is very even and well maintained. 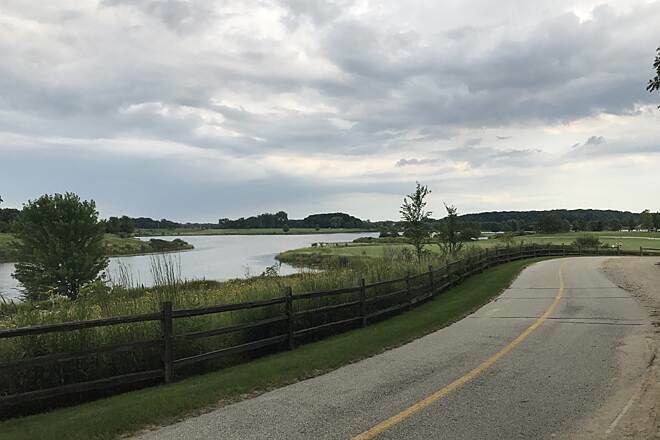 The trail winds through several parks and forest preserves, and as such there are ample facilities and parking. Street-crossings have been well thought out with only a few thoroughfares to cross, at which there are marked crosswalks. The appeal of this trail is the diverse areas through which it passes. There are areas where you will have fellow trail users, and other areas where you will enjoy the solitude. And distance is clearly delineated for runners who may want to pace themselves. For its beauty, diversity and serenity, I give this trail the ranking of great trail!"